A mild drama and rowdiness temporarily occurred during proceedings at the Edo State Election Petition Tribunal siting in Benin City on Tuesday when one of the petitioner’s witnesses (PW 14), Mr. Yusuf Seidu Abu mounted the dock only to claim that he was not just a witness but at the same time, a petitioner against the Edo 2016 governorship election. 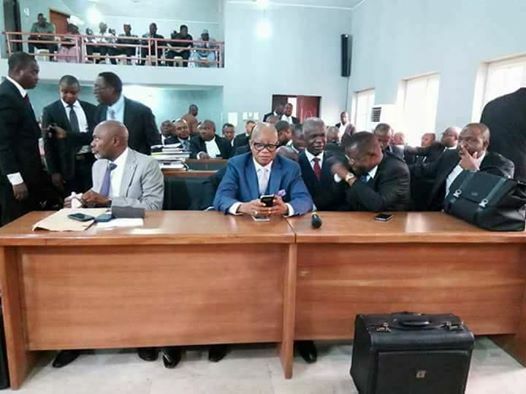 Recall that the petitioners in this case are the Peoples’ Democratic Party (PDP) and her candidate, Pastor Osagie Ize-Iyamu. Prior to the mild drama and mirth occasioned in the courtroom by Mr. Abu, who was facing cross-examination, he said, “I voted in unit 001, ward 8 and I functioned as the ward collation agent for the PDP. We had 9 polling units”. However, on being asked that, ‘When the petitioner in his petition stated that you had 10 polling units, did you object?’ he thundered saying, “I am the petitioner”. This reply evoked laughter and served as a timely dose of comic relief in an otherwise serious court case. The witness, who had earlier stated during cross-examination that although multiple voting in some units was his grievance, he also wanted to add over-voting and non-accreditation to his complaints. He however buckled when asked if he was in all the units to have noticed multiple voting. “I was not in unit 9 to have noticed multiple voting. I was in unit 001. In unit 08, I was not there to have noticed multiple voting because I registered and voted in unit 001”, he answered. Continuing in a booming voice, he said, “I was the ward 8 collation agent, but I did not sign the result sheet and nobody signed for my party. I signed the unit result as the polling agent”. According to him, he claimed he signed the result sheet because there was nothing he could do even though I was not the polling agent. Further attracting laughter, PW 14 who on one hand noted, “Accreditation and voting did not take place simultaneously” however agreed to have voted without accreditation saying nothing was wrong with his action.